Mistwood is where the Shifter hails, a creature of legend that is bound by an ancient spell to protect the king of Samorna. When Samorna is peaceful, she goes back to Mistwood, but when she always comes when she is needed. Isabel remembers nothing, not until before Prince Rokan fetches her from Mistwood. She can’t remember what happened, what her powers were and she gets glimpses of memories that doesn’t make sense. All she knows is she has to protect Rokan, even if she feels that she can’t trust him. 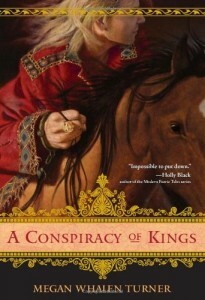 As Isabel tries to uncover the threats to her prince, she tries to piece together her memories and weave through all sorts of court intrigue. She can’t trust anyone, and when she finds out the truth, she wonders if she can trust the person she’s sworn to protect. 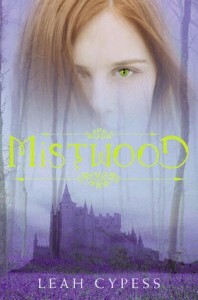 Mistwood is beautiful, in writing and in the characters. It was easy to slip into the kingdom of Samorna, which made it easier to focus on the characters which really made the story move forward. Like other readers, I was never sure who to trust — not even Isabel. I wasn’t sure who to root for, and I wasn’t sure who is telling the truth. I liked how the story tends to defy expectations — just when you thought you’ve had it all figured out, the author takes a different turn, keeping you guessing. I have to admit that there was a time when I just wanted to figure everything out once and for all and skip a few pages, but I’m glad I kept on reading. However, I think this book kind of fell into the “I shouldn’t have read this right after reading really awesome books that blew me away” category. 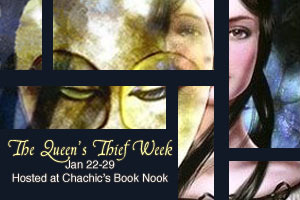 I liked Mistwood, but I think I made a mistake of reading it right after I read the first three books of Megan Whalen Turner’s The Queen’s Thief series. It was kind of hard to shift from Sounis/Eddis/Attolia to Samorna, and I can’t help but feel like Gen was going to pop up in a page in Mistwood. That was my mistake — learn from it! I did say that when I finished The Queen of Attolia, I cannot not pick up the next book, right? And that is very true — soon as I finished that book, I immediately picked up The King of Attolia to know what happens next. Because really, after you’re done with Queen, how could you not want to know? I’m going in circles, I’m sorry. Spoiler warning for The Thief and The Queen of Attolia from this point forward. Seriously, don’t say I didn’t warn you if you read on and haven’t read the first two books. So there is a new king in Attolia after years of not having one. But the Attolians aren’t rejoicing because they do not believe in the king. The scheming people who want to remove the queen think it’s easy to get rid of the king, too, while the loyal ones to the queen believe that the king is a fool. Reminiscent of school bullying, the Attolian court make life for the new king hard with various pranks and mockeries. But those pranks are nothing compared to an assassination attempt at the king. In the middle of all of this is Costis, a simple guard who did the wrong thing to the wrong person at the wrong time. 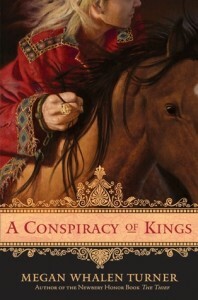 This makes him an unwilling companion to the king, and privy to his personal moments with the queen. His contempt for the king soon fades away, when he realizes what we readers have known or a long time: that the king, Eugenides, the Thief of Eddis, is smarter and more cunning than everyone in the Attolian court combined. That, and he loves the Queen of Attolia and she loves him back. Again, I must say: Megan Whalen Turner is a genius. Or a GENius, because Eugenides is a genius. After reading the first two books in the series, I already know what Eugenides is capable of, so it felt like I was in on a big secret as I read the book. I felt sorry for Costis, but I was amazed at how the events unfolded. MWT is amazing with hiding things from the reader, and making us wonder about the schemes and secrets of her characters. We know that Eugenides is smart, but why does it feel like he’s being beaten? What is the queen doing? Where is Eddis? But as good as she is with hiding things from the reader, she’s also extremely skilled in revealing it bit by bit, and convincing readers of how it was all planned all along when we get to the end. 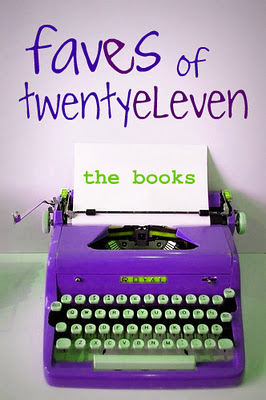 It makes for a very, very satisfying read, and it made me fall in love with the series and the characters as I go on. 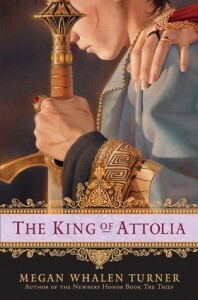 So last week, I finished reading The King of Attolia by Megan Whalen Turner (review will be up this weekend!) and I couldn’t help but mutter, “Genius!” every time I think about that book. But now that I’m done with the three MWT books I have on hand, what do I do now? Across the small peninsula battles are fought, bribes are offered, and conspiracies are set in motion. Darkening the horizon, the Mede Empire threatens, always, from across the sea. And Sophos, anonymous and alone, bides his time. Sophos, drawing on his memories of Gen, Pol, the Magus and Eddis, sets out on an adventure that will change all of their lives forever. After the greatness that is the first three books in the series, how can I not want the fourth? That, and I have been wondering what happened to Sophos, anyway. This book has been available since last year in local bookstores, but I am only wanting it now. I could buy it, I know, but I’m kind of iffy because it’s still in hardback, and my first three Queen’s Thief books are in paperback! I want my set to match! :( I think the paperback will be out this year, though — I think I can still wait.